It is an honor and a privilege for me to be elected as president of VOS. I am excited to serve VOS, which has been and will continue to be the premier voice for musculoskeletal health care and the premier provider of continuing orthopaedic education programs in the Commonwealth of Virginia. 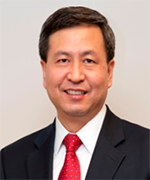 First of all, I would like to take this opportunity to thank our outgoing president, Dr. T.K. Miller, and immediate-past president, Dr. Mark Romness. They not only trained me to be an orthopaedic surgeon, but also served as role models for me. I have witnessed them working tirelessly in the past several years organizing VOS annual meetings and fighting on the battle front of medical reform. With their leadership, VOS made significant progress on several key issues, including worker's compensation, prescription drug misuse and the Certificate of Public Need (COPN) system. We move into 2017 with a commitment from legislative leadership to fully take on COPN and consider real reform. However, we understand that the fight is far from over. The VOS Board will look forward to continued work on this important issue. Secondly, I would like to thank and congratulate Dr. Bradley Butkovich, the Program Chair, and his committee members: Ilvy Cotterell, MD from VCU, Winston Gwathmey, MD and Truitt Cooper, MD from UVA, and Trevor Owen, MD from Carilion, for an excellent Annual Meeting in Colonial Williamsburg on April 15-17, 2016. The location was beautiful. The lecture by our keynote speaker, Dr. James Andrews and AAOS reports by the current AAOS President Dr. Gerald Williams were exceptional and the highlights of the meeting. The educational program offered expanded CME hours totaling up to 11.75 AMA PRA Category 1 Credits. The PA breakout session was also very successful. As the newly elected President of VOS, I promise to work hard for our members' behalf and interests. My goal is to engage our VOS members and non-member orthopaedic surgeons of the Commonwealth of Virginia to show them the tremendous values VOS has in helping them provide the best orthopaedic care to their patients in Virginia. We understand that working together as a team is the key to success. As a Board, our goal over the next year is to increase membership. Our hope is that by working with the majority of our orthopaedic surgeons in Virginia, we can be more influencial in overcoming the many obstacles during this challenging time in healthcare. We will continue to focus on education and legislation. 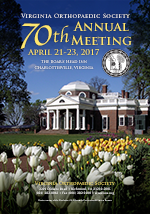 Our 70th Annual Meeting will be held at the beautiful Boar’s Head Inn in Charlottesville on April 21-23, 2017. Dr. David Weiss and Dr. Winston Gwathmey from UVA will be our Program Chairs for the meeting. The program committee also includes Dr. Bradley T. Butkovich, Program Chair for 2016, Atlantic Orthopaedic Specialists, Virginia Beach; Dr. Richard J. Myers, Sentara Orthopaedics, Norfolk; Dr. Benjamin Coobs, Carilion Clinic Orthopaedics, Roanoke; Dr. James Browne, UVA; Dr. Varatharaj Mounasamy, VCU; and Dr. Michael Holzman, Inova Orthopaedics, Arlington. In addition to general topics, trauma and adult reconstruction including joint preservation for young arthritic patients will be the main themes of the meeting. From a legislative point of view, the VOS board has actively participated in many activities that are imperative to the process for policy reform. Many thanks to our member and non-member volunteers who had participated in White Coats on Call and committee hearings, in particular, Dr. Wilford Gibson, our veteran fighter, and Cal Whitehead, our state lobbyist, for their expertise and efforts. We will continue to work on behalf of our members and patients for many ongoing legislative issues including COPN, the Flexibility in the EHR Reporting Act, the Promoting Access, Competition and Equity (PACE) Act, and the Sports Medicine Licensure Clarity Act, to mention a few. Again, it is a privilege to serve the VOS and I look forward to the challenges ahead!